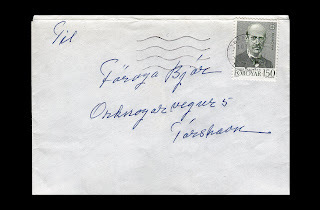 Cover with postmark of Tórshavn over the 150 øre stamp of the 1980’s issue ‘EUROPA – Celebrities Linguists and Folklorists’ sent on December, 19 1980. 150 øre it was the postal rate in use since 11-07-1979, to the inland, Denmark, Greenland, Scandinavia and Europe countries for letters with weight until 20g. Postmark used between 01-VI-1962 and 30-VI-1988.